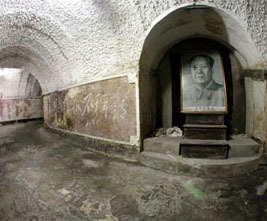 Beijing’s Underground City, a bomb shelter beneath the ancient capital’s downtown had been forgotten for over twenty years by the local citizen inspite of it being well known among the foreigners when it was officially opened in 2000. This Underground City was also called the Underground Great Wall due to the same military defense. This complex is the relic of the Sino-Soviet border conflict over Zhenbao Island in northeast China’s Heilongjiang River, in 1969. It was at the time when Chairman Mao Zedong had order the construction of subterranean bomb shelters in the event of a nuclear attack. The tunnel which was built between 1969 and 1979 by more than 300,000 local citizens as well as school children stretch for more than 30 kilometres covering an area of 85 square kilometres eight to eighteen meters beneath the surface. It also comprises of around thousand anti-air raid structures. For the purpose of supply materials necessary for the complex, centuries-old city walls as well as towers which had once circled ancient Beijing had been destroyed and the old city gates of Xizhimen, Fuchengmen, Chongwenmen and several others remained in name only with the exception of two embrasured watch towers from Zhengyangmen and Deshengmen which seemed to survive. In case of an attack, the intention was to house forty percent of the underground population of the capital together with the remaining to be moved to the neighbouring hills. It was said that each residence once seemed to have secret trapdoor nearby which lead to the tunnels. With regards to how far the hand-dug tunnels tend to stretch, there is no authoritative information available; they apparently linked most of the areas of central Beijing, from Xidan and Xuanwumen to Qianmen and Chongwen districts as far as the Western Hills. They were fortified with facilities like clinics, school, stores, restaurants, theatres, reading rooms, factories, a grain and oil warehouse together with barber shops as well as mushroom cultivation farm for cultivating foods which needs little light. They have over 2,300 ventilation shafts installed together with gas and waterproof hatches constructed in order to protect the insiders from chemical attack as well as radioactive fallout. Besides this, there are also over 70 sites within the tunnels to dig the wells. Printed on the walls, one will find Mao’s slogan calling for people to dig deep, prepare provision and not to seek control. However, the underground city was never needed for the intended purpose though it had been maintained by city officials. Every year during rainy season, the water conservancy authorities tend to check if it is included in anti-vermin sweeps. Since then the tunnel has been utilised by young lovers and children challenging each other to remain in the darkness longer than their friends though they were largely shut off, for safety purpose. Some of the shelters on busy streets are being utilised as low priced hostels while the other have been changed into shopping and business centres or theatres. Inspite of the fact that there are several entrances, foreign visitors tend to see a small approved section accessed through a small shop front in Qianmen, south of Tiananmen.